Online Sales Tax Fight in Mass. 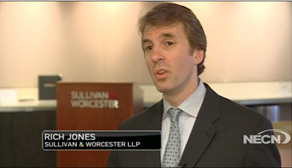 Richard L. Jones was interviewed by NECN to discuss the "Online sales tax fight in Mass." Mr. Jones explained how "a company that owns and operates and uses a parcel of real estate or a building, or has administrative offices within the state, would be enough to trigger the legal requirement to collect sales tax for sales in Massachusetts."